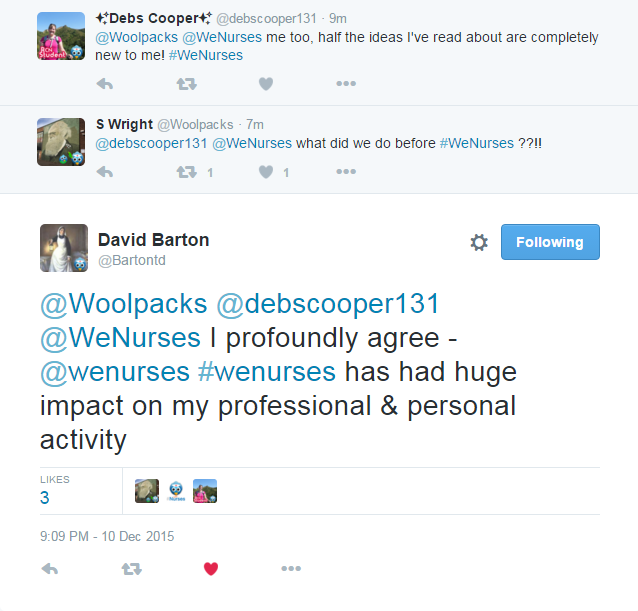 Its very rare that I stop and look around and really take in the impact that WeNurses is having and Tweets like this often take me by surprise. WeNurses started because of my own need to connect with other nurses, as an agency nurse I found it a real struggle to connect, in order to learn, share ideas, experiences and expertise and found that this was having an impact on the way I nursed. 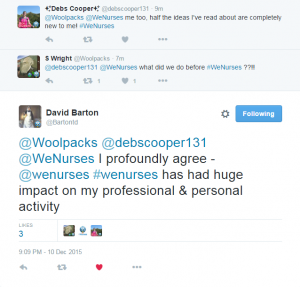 Its been over 5 years since I first started Tweeting and blogging and in that time WeNurses has come a long way. The community has become diverse, proactive and valued and this is driven by the thousands of tweeting nurses out there. Sometimes I struggle to see the wood for the trees though. I look to the future and can see how far we still have to go; there is much to do in terms of how well nurses use this space, how we can make the most of social media and how we can continue to use it safely and wisely …. but tweets like these remind me how far we have come and that this community really is making a huge difference to nurses.